By mid-2012, the Learning Partnership Didarchtik came to an end with a last workshop, at Butser Ancient Farm in the UK. Many subjects we had touched upon over the previous two years came back on the table – just as needed: this was the moment to look back on our experiences and see if we had learned something. Besides wrapping up our experiences, it was an extra-long workshop to get to know one of the oldest archaeological open-air museums in the UK, and with an enormous international reputation. The Butser team had made an effort to offer us a very diverse program, forcing us to think, evaluate Butser and ourselves. On arrival on Day 1, we were stopped at the car park which leads to the entry of Butser. Over the summer of 2012, a new entrance building is being constructed and when we got there, the old building had already been removed, so the entrance area was modest. Each of us got a paper guidebook and we were sent into the site, to discover Butser at our own pace. For most of us this was the first visit to Butser – and this is the way most adult visitors who visit, away from the main events, will discover the site. Other sources of information are the furnished houses and the information panels that go with them. Most of us thought we got a good overview of Butser this way, also because we are used to these kind of sites. However, when we got a guided tour by one of Butser’s employees in the afternoon we realised we had missed a lot! 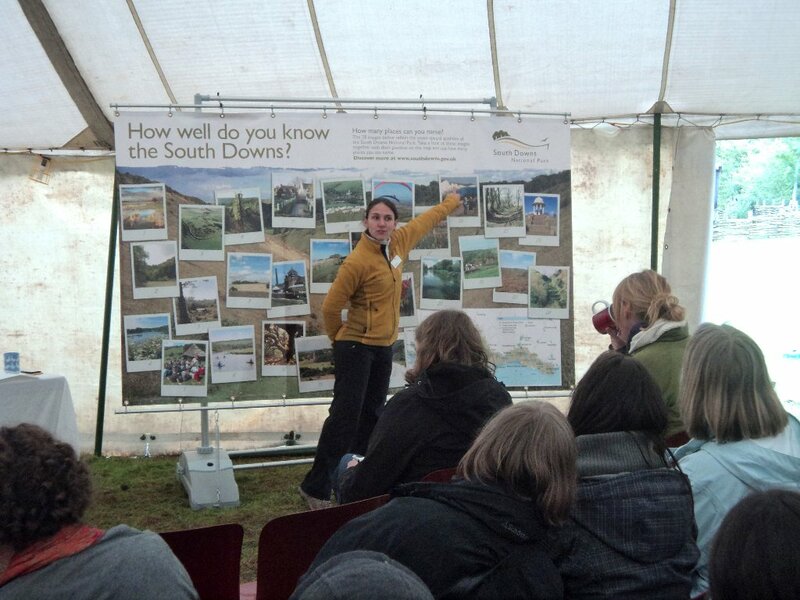 A good presentation was given by the South Downs National Park. Butser is located within this park which covers an area of over 100 miles wide from east to west, not far from London. Although the South Downs attract many visitors and create valuable partnerships, there is still unexplored territory in the sense that certain adult visitor groups are missing; there is discussion about returning visitors et cetera. The Park has similar issues as some archaeological open-air museums but has a wider network and more possibilities we can learn from. One clear thing: the direct environment of a museum and the facilities around are very important as many people do not come to this area just to visit Butser. They want coffee, a hotel and something else to do the next day. Early on Day 2, we got a presentation by John Evans, disability rights consultant and activist. He presented in a seemingly very simple way one of the most challenging issues for our type of museums: “diversity, disability and inclusion for all in all activities”. It is vital we work in a diverse and inclusive way in order to ensure we have the participation of different kinds of people in the world we live in. There are many different kinds of disabilities; therefore there is not one approach which fits all. They do not want to be patronised or treated differently from anybody else, as having an impairment does not make people less intelligent. What Mr Evans referred to can be simply summarised as good customer service. Disability or not, no two visitors are the same, so each needs a custom fit approach. There are wheelchair users who need certain practical adaptions in a museum; blind or deaf people require other adjustments and so do those who are autistic, have a learning/intellectual disability or any other. All this doesn’t have to cost a lot more. An old poster in the Netherlands printed on a mirror says: “have you ever met a normal person? Well, did you like it”? We will have to approach each of our visitors as meaningful individuals. In the afternoon, we attended four different activities, four workshop for adults. The activities were themed with metal casting, wool spinning and dyeing, cooking a Roman dinner and making mini-frescoes (pendants). We were purposefully given a lot of hands on experience and information, less attention to the techniques of ‘teaching adults’ – this was something we should be able to extract after two years of Learning Partnership. Most participants completely got into these four activities, a welcome experience! Following on that, we were challenged to build our own roundhouse! Three teams were made and the idea was to build a house with the materials offered, without explanation. This required each team to discuss, get a plan and execute it – not all material was ready made! It was a follow up to the competition we had had in Bäckedal Sweden, on making a fire and again, it was good to do a similar activity or touch upon a similar issue as before in this project and see if we had made any progress in understanding how to get such a job done. The evening we spent in the Roman Villa at Butser, having a great dinner with original Roman recipes. On Day 3, we started with four presentations by Butser people, each of them telling how they deal with adults and adult education. Not only visitors get educated in a museum, but the staff itself as well! Staff themselves are getting regular training, including health and safety but also on contents (the story being told has many sides to it: from a basic story ‘what is the Iron Age’ up to how do you construct a round roof and why do you have such funny pigs). Butser has about 200 volunteers. To them, being involved is made very easy, the structure is loose and they learn by talking with the employees and they learn by doing. Volunteers are not just unemployed or retired people, also people at the start of their career are able to get relevant experience at Butser, benefitting both the museum and the volunteers. Some of these young people, especially the ones with a more complicated background, who are listed at a school for special needs children are spending some of their time at Butser where they can learn by doing things. This is good for their self-esteem and offers them another way of looking at life. The last category we heard about were Butser’s Friends. Many of them started once as volunteers, in the 1980s and 1990s but they do not have the energy anymore to be actively involved in for example coppicing wood. Many of those have found that by being a donor of money; they get a sense of belonging in return and the feeling of having done something good.